I checked Google street views, and it looks like there might be a parking lot where the hotel once was. 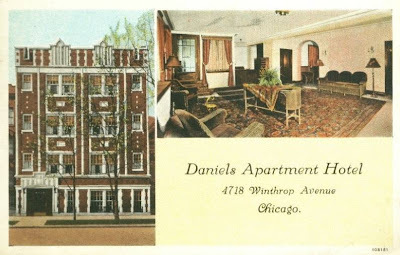 You are correct, the Daniels Apartment Hotel was torn down sometime, I believe in the 70's. I discovered that fact, unfortunately, when I went to take photos in 2007. My great grandfather, Fred Owen Emery Daniels built it, but lost both the hotel and his other business, the Terminal Garage, (located at 4464 N Broadway, Chicago) sometime in the Great Depression.